Last but certainly not least is the newest member of the Women’s Elite Team, road racing warrior Obsie Birru. Welcome Obsie! Obsie Birru joined the NE Distance Athlete-in-Residence program in August of 2017. Obsie, a 28 year old Ethiopian-born, American-raised, and self-proclaimed proud Iowa girl, comes to Providence directly from her hometown of Des Moines, IA, where she has been working as a Supporting Teacher in a kindergarten classroom for the last three years. It was while getting her degree in Health Promotions and Wellness Management at Grand View University where Obsie burst onto the running scene. By the time she graduated in 2012, she had become one of the most decorated NAIA athletes in history. During her time at Grand View, she was three-times named the National Runner of the Week, was an astounding eighteen-time All-American, and was a five-time National Champion in the 5,000m, 10,000m and marathon. Upon graduating, Obsie ventured into the world of American Road Racing where she once again found great success, particularly on the USATF Road Racing Circuit. She was 15th at the 2017 USATF Half Marathon Championships, 11th at the 2017 USATF 7 Mile Championships, and 5th at the 2017 USATF 25k Championships. In addition, Obsie was also a qualifier and participant at the 2016 US Olympic Marathon Trials. 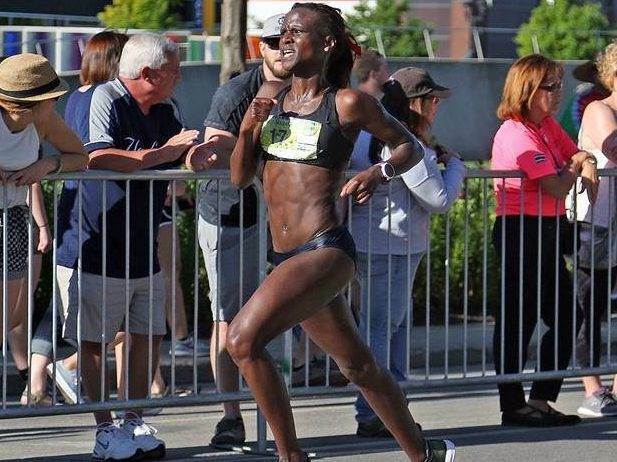 She has twice claimed the honor of first American at the prestigious Medtronic Twin Cities Marathon, and in 2015 she set a PR of 2:36:53 with her performance there. During her post-collegiate career, she has also competed well on the track and the cross course as she set a PR of 34:48 for 10,000m at the 2013 Mt. Sac Relays and finished 19th at the 2016 USATF Club Cross Country Championships. Obsie joins NE Distance with a desire to help NE Distance continue to pursue its unique dual mission. With three years of experience working with young children, she is eager to begin coaching at the middle school level. She looks forward to sharing her love of running and knowledge of the sport with both the youth athletes as well as the RI running community as a whole. Athletically, she is excited to train and compete alongside NE Distance’s Women’s Elite Team as she continues to chase down her running dreams.